Larkin Poe - Lasttix. Be first in line for last minute tickets. This offer is in high demand! *Additional fees including Booking, Credit Card & Handling charges may be levied at purchase. Tickets are subject to availability which must be confirmed with the ticket retailer. Sisters Rebecca and Megan Lovell of Larkin Poe are carrying on the American roots tradition with their own innovative blend of blues, Americana and rock on their latest album Peach. Peach is comprised of half blues covers and half original material, that harkens towards Megan and Rebecca's southern gothic heritage. 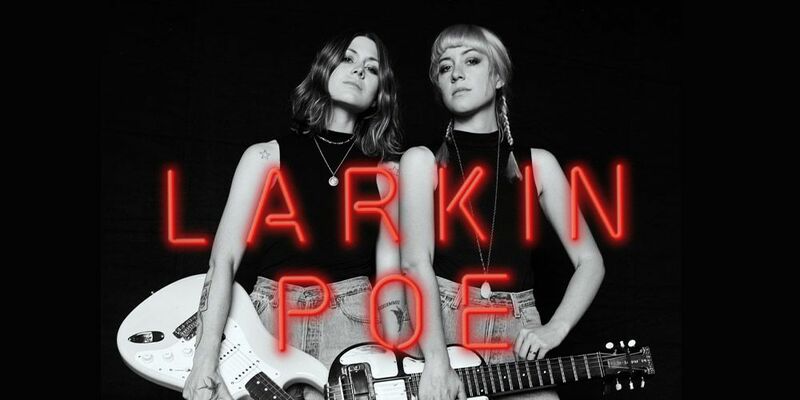 Originally from Atlanta and currently living in Nashville, Larkin Poe named the band after their great-great-great-grandfather, a distant cousin of writer Edgar Allan Poe. Megan and Rebecca have previously hit the road as support for Bob Seger on his arena tour, have opened for Gary Clark Jr, Queen and Keith Urban, and have been the opening and backing band for Conor Oberst, Kristian Bush (Sugarland) and Elvis Costello. Larkin Poe have performed at England’s Glastonbury festival twice, were named “Best Discovery of Glastonbury” by the Observer, and their electric and slide guitar riffs earned them the title of "little sisters of the Allman Brothers" among fans and followers. Don't miss their sideshows in Sydney and Melbourne in 2019. "A sister act with staying power"
"...These gals like their gritty Southern heritage with a cosmopolitan twist"
"they have a head start on the rest of us with the unique power and beauty of sibling harmony"
© 2019, Tickets PTY LTD. All rights reserved.